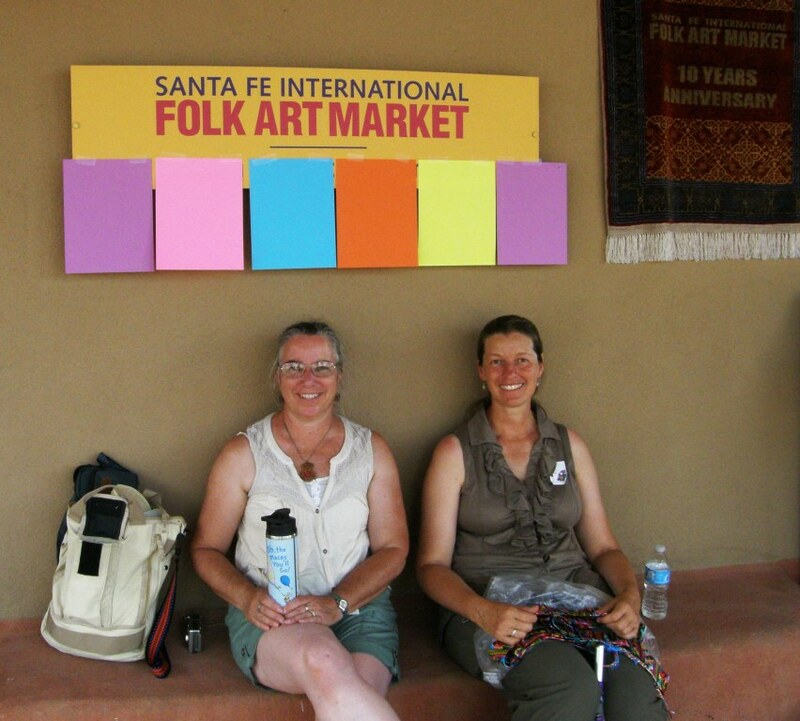 The last part of my US summer trip was spent in Santa Fe, New Mexico. 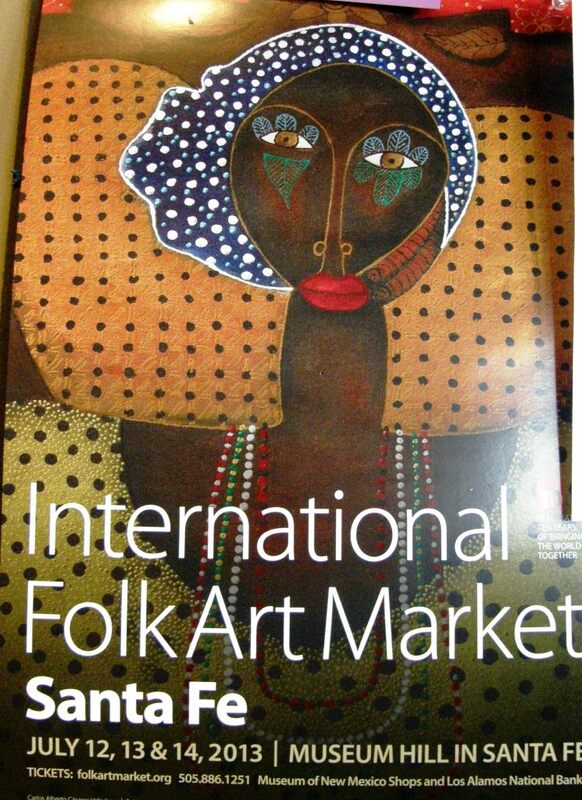 It had been a dream of mine for some time to visit the city’s annual International Folk Art Market and this year everything just fell beautifully into place. My friend Annie and I had talked about the vague possibility of this visit months and months ago. Neither of us knew back then whether it really would happen. I couldn’t think of a better person with whom to visit the market. Even when weaver friend Wendy visited me in Bolivia back in May and I found out that, by coincidence, she was also planning on going, it was still pretty iffy. And then, when Marilyn, whom I met at ANWG in June, said that she too was going, I knew that it just HAD to happen. 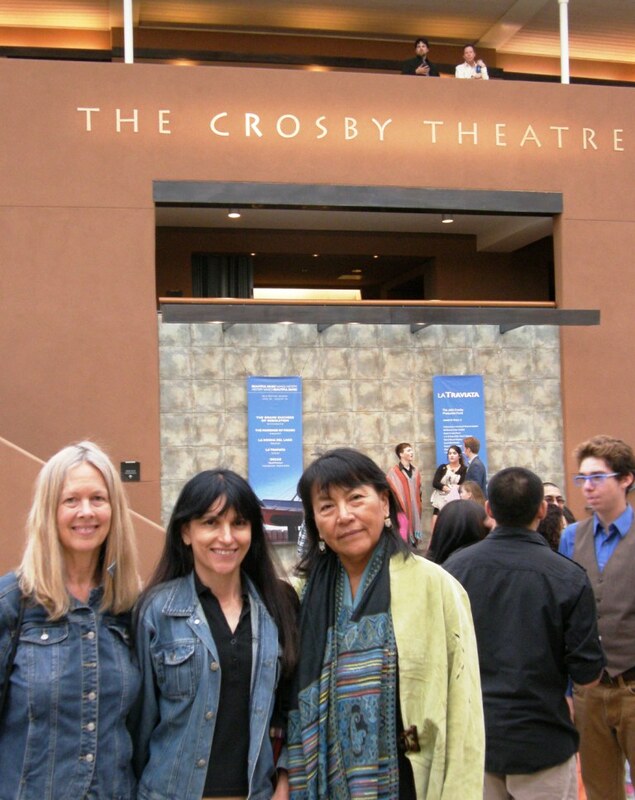 I had met textile artist DY Begay at the Tinkuy in Cusco in 2010 and again last year at the weaving Encuentro. 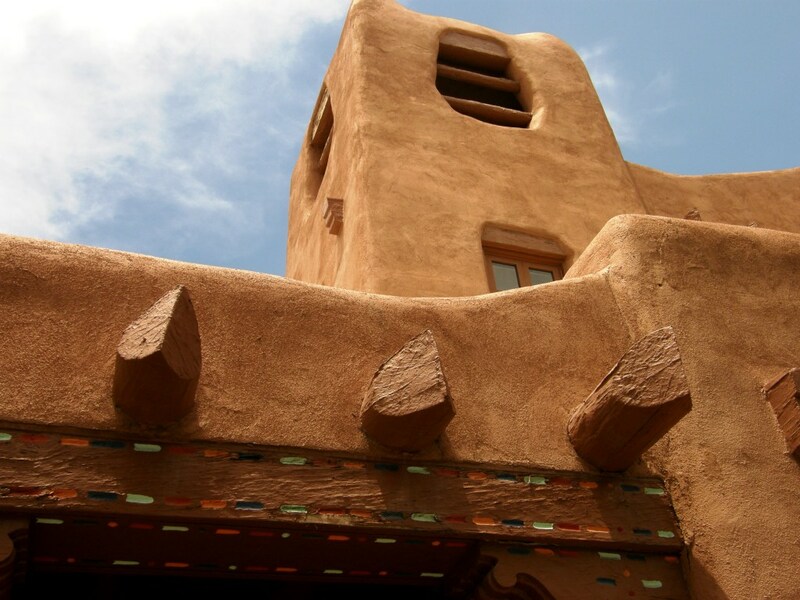 She now lives in Santa Fe and extended an invitation to come visit. And that is how it all came to be. I arrived a few days before the market and had a chance to stroll around the downtown area. When I arrived at Santa Fe airport I was surprised to see the adobe airport building…hmmm, a little over the top, I thought at the time. However, after taking a look around and seeing the downtown area, where even the parking stations are adobe and getting a feel for the place, it all just felt so very right. I love the smooth curviness of the structures and how the colors change from pink to gold as the sun moves across the sky. And that sky! …the deep blue of dry desert air that would suddenly be covered by enormous black thunderheads that brought refreshing afternoon deluges. And it was hot… but not Santa Cruz hot…the low humidity made the high temperatures quite tolerable. Yet, after a full day of strolling the market, it was a relief to sit down in a shady spot and wait for the rain to start. Below you can see Annie and Wendy at the end of day one. There were thousands of people at the market yet I just knew that I would run into Wendy and Marilyn there. I had already bumped into Wendy by chance at the Travelers’ Market and Marilyn in the plaza downtown and at the pre market procession. It was like we were all magnets drawn to each other. Another person I met by chance was double weave expert Jennifer Moore who was helping out Nilda Callañaupa at the CTTC booth. She and I then arranged to spend a day together while I showed her how to set up a backstrap loom for double weave pick-up. I got to see all her amazing double weave samples, the ingenious things she has made and the limits to which she has pushed this structure. It was impossible to pick favorites from the array of samples she showed me but here are just two of the many things that caught my eye…(these are Jennifer’s pictures). I loved the completely seamless bag Jennifer created for the Checkers pieces. I believe that the checkerboard was woven as a double width piece….woven folded and then opened to its full width once off the loom. 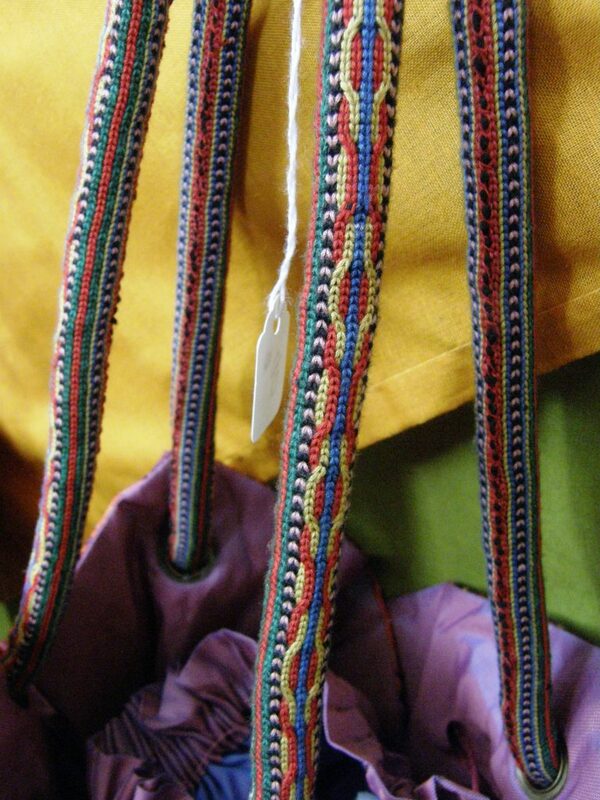 Even the narrow sleeve on the bag for the drawstring was created on the loom. 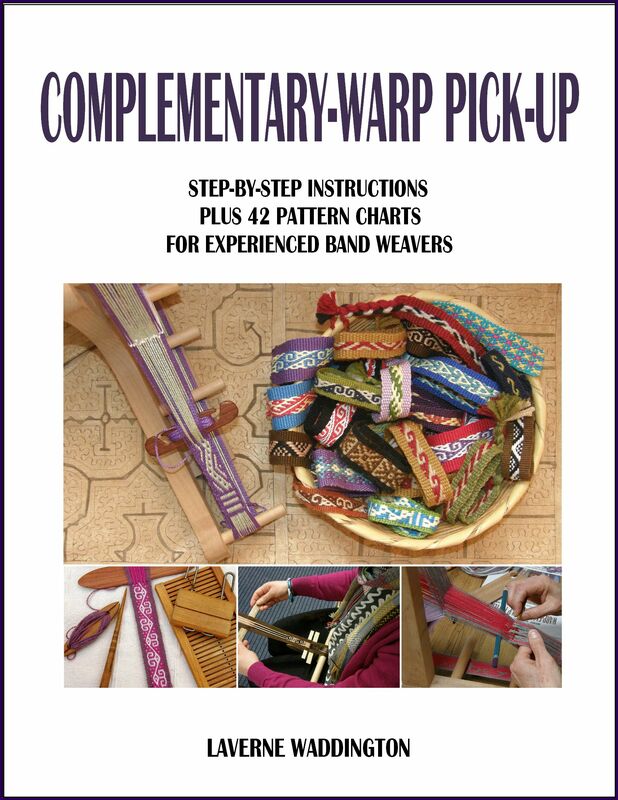 The twill double weave pick-up is gorgeous. Jennifer and I then went on to spend a magical final evening going to the opera, La Traviata, with DY and DY’s neighbor Alana, who had offered us the tickets. I had no idea what to expect and it was amazing! Santa Fe has an outdoor theater. It’s covered but has open sides. 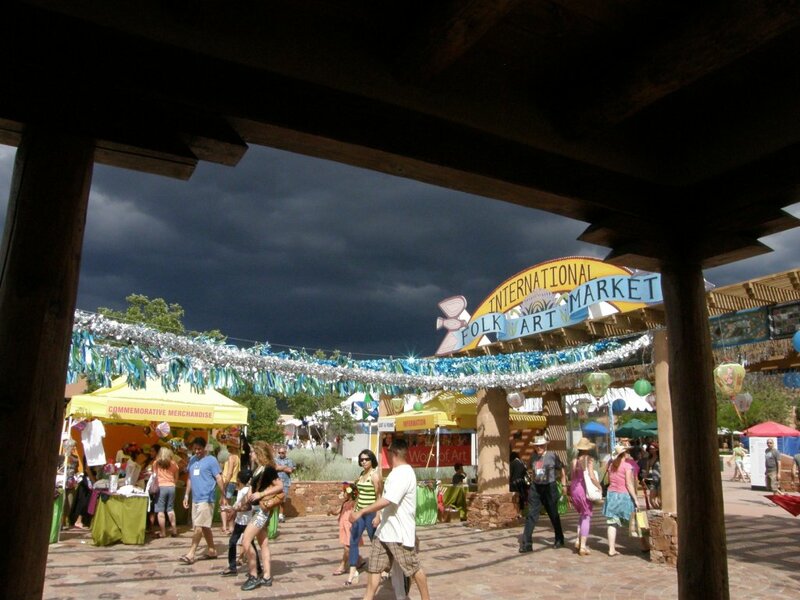 The sets are minimal and the backdrop is the beautiful Santa Fe sky which changes colors as evening fades into night. Desert nights get rather cold! The theater ushers certainly knew about that as they were all dressed in long handwoven ponchos. And, speaking of cold, here I am back in Santa Cruz in the one cold wave that hits here per year. I just happened to arrive back the day before it hit…48 degrees…this is not normal. I managed to get in one day at the loom in shorts before the long pants and socks had to come out. Well, it IS winter after all. This is where I was at with my weaving when I left Janet’s place in northern California. You can see that I had just started some warp wrapping having been inspired by the saddle bag, from Afghanistan, (we think) that Janet had bought. However, after going on with that for half the afternoon, (bags still unpacked in the living room!) I decided that I didn’t like it. I think that I need to practice the wrapping using wool, which fluffs out and fills space, before trying it with the unforgiving cotton. So, the other half of the afternoon was spent unweaving and unwrapping (not so much fun) and then….unpacking (even less fun). Then I got back on track. Janet’s saddle bag inspired the wrapped design above the main motif. 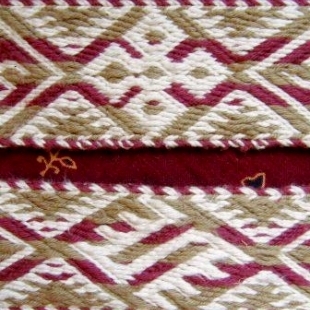 Bhutanese motifs form the basis of the rest. This had me calling the project “Tales from the Sub-continent”. However, now something from Central Asia is about to creep into the mix because of bands that I saw at the Folk Art Market. I am so happy to be able to add something from that event as that means that this project will comprise a few pieces of inspiration from my summer trip. That’s one of the best souvenirs I could have. It’s off the loom and is going to be a bag. You can see how it will be folded on the right…that’s the back. 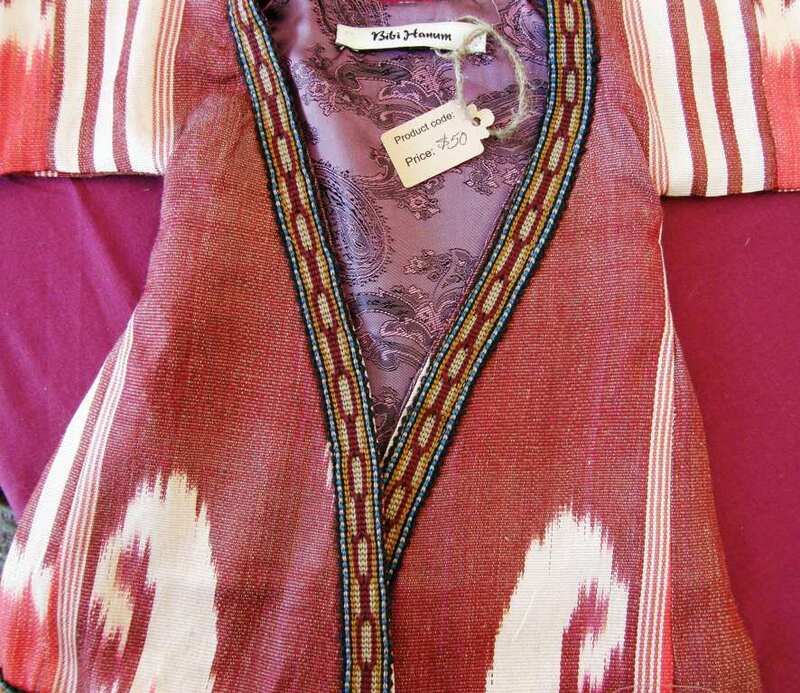 As for the Central Asian influence, you might remember that I went to the Central Asian ikat exhibit, Colors of the Oasis, at the Textile Museum in Washington DC in 2010. 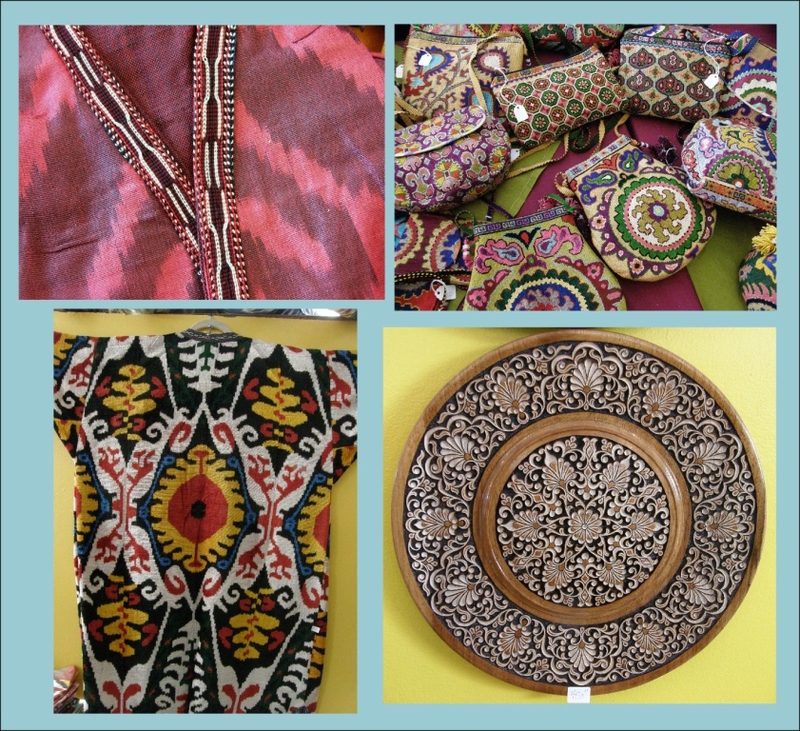 The ikat pieces were stunning. In fact, I had to go twice beacuse it was too much to take in. I was interested at that time in the bands that edged some of the coats. As the exhibit was focused on the ikat patterning and process, no one at the museum could tell me anything about those bands. 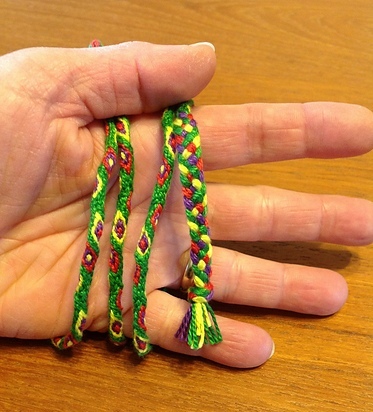 They looked like they had been card woven but someone also suggested that they had been braided using finger loops. 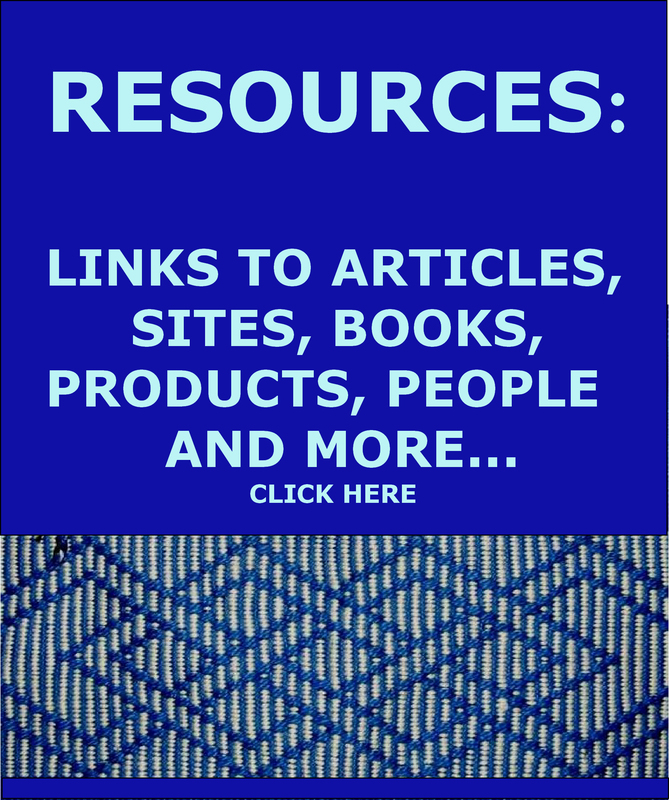 You simply could not get close enough to see anything helpful. However, at the Folk Art Market we got to touch all the gorgeous ikat patterned coats from Uzbekistan and look as closely as we pleased at the edging bands. 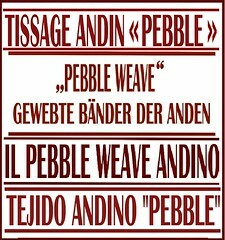 Yes, there were wefts, they were woven, and one of the representatives did confirm that they were tablet woven. So, here is where I am at…. I dug out my tablets. These are the ones that my dear friend Gladys Miller gave me way back in 1995. 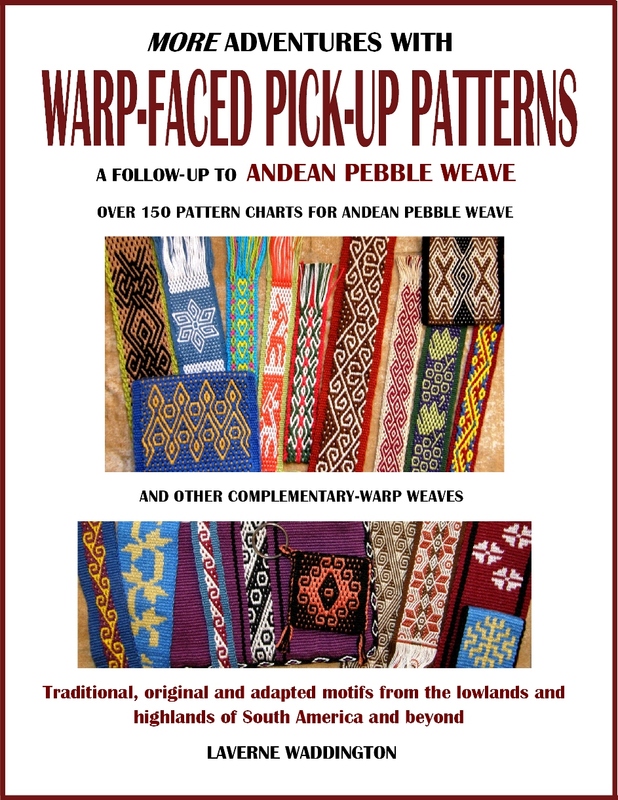 They pre-date my Navajo-style weaving activity and my first backstrap learning trip to Peru. Gladys sent me back to Chile with these tablets and Rachel Brown’s book. Later I got more books and made the piece at left. 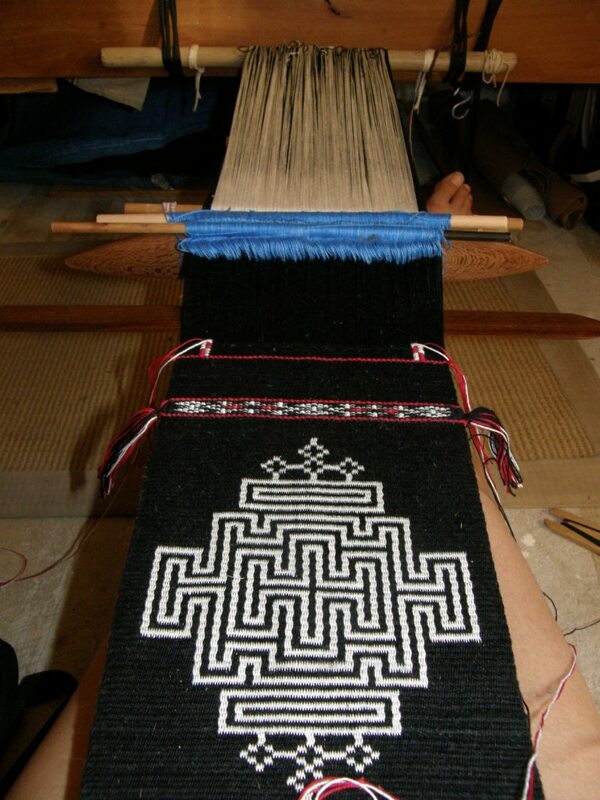 After that, I had my Navajo loom built and immersed myself in tapestry weaving. Then came the first trip up north to Peru….and the rest is history! So, I made a wee sample to see if I could remember the basics of threading. 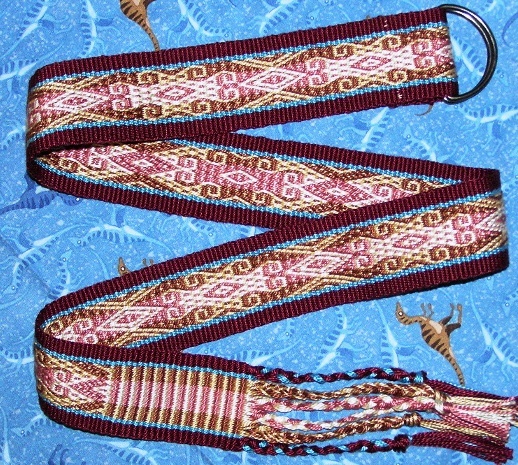 I want the strap of my bag to be the same design as the bands that edge the Central Asian ikat robes. Most of the bands are very similar in design and very simple. It is interesting that on page 71 of the Snows’ Step by Step Tablet Weaving, there is a picture of a Russian apron band that looks almost exactly the same. 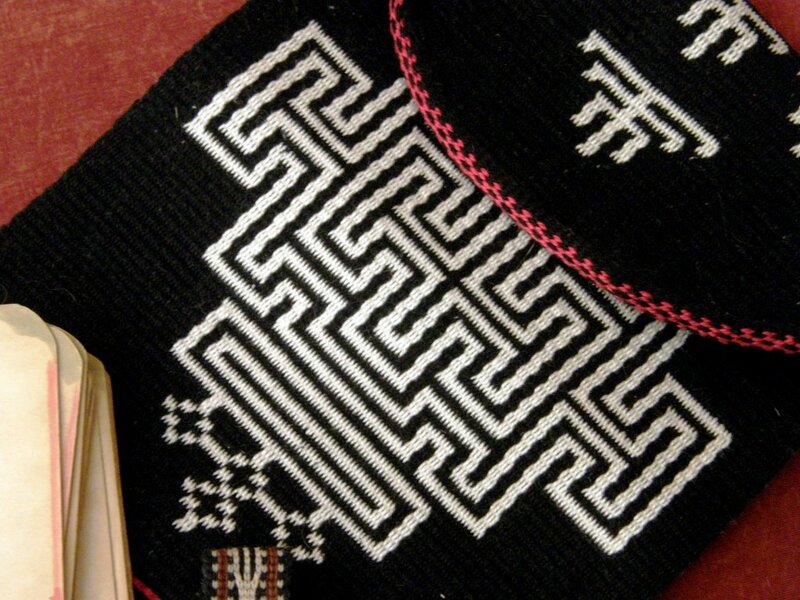 I was lucky to be able to buy a wristlet at the market (you can see it sitting on my weaving above) as an inexpensive example of the weave. 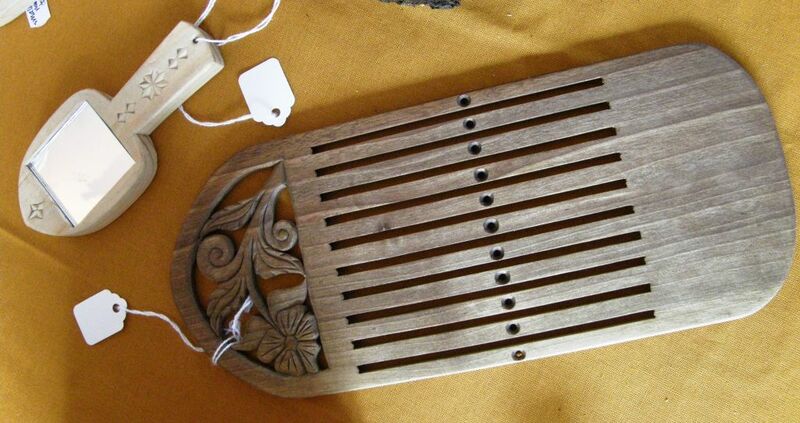 I know that you will all be looking at the price tag on the above piece and sighing. Let’s all go to the market together next year! I only bought one other thing. It was another sample type thing to study…Guatemalan gauze, white on white on a miniature loom. 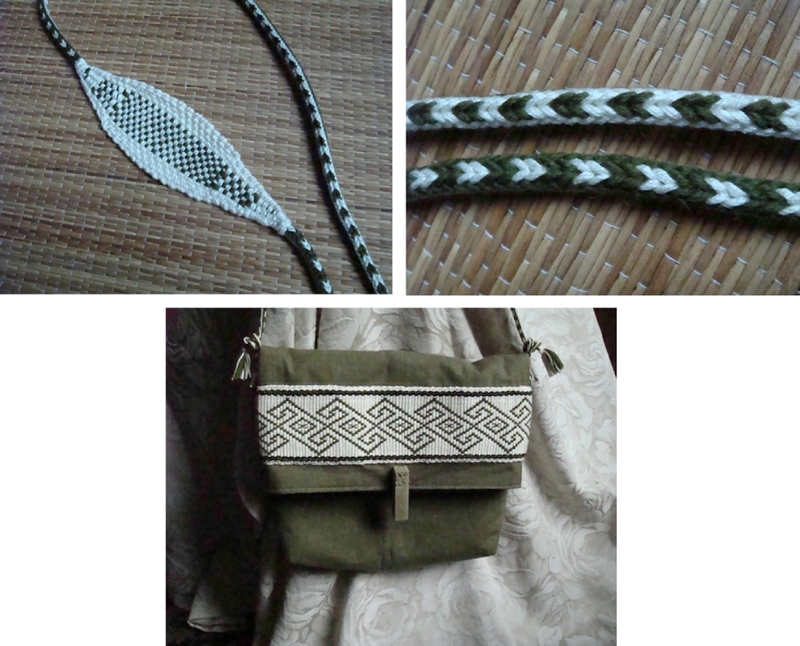 It was fun to see how the tablet woven bands are also being used as tubes for bag straps. I would say that they were sewn into tubes after being woven and stuffed with something. Mine, however, will be flat. I did include a tubular band on my current bag project as an edging. I so enjoy weaving and sewing those tubular bands and they make such nice finishes. Using a tubular band to edge enabled me to cover and stabilize the cut raw edge that was created when I cut the flap into a rounded shape to make it more attractive. Speaking of tubular bands, DY and I had some weaving time together at her place. DY had learned to make the ñawi awapa with me at the Tinkuy but had not put it into practice since then. Of course, all she needed was a little refresher and soon she was on her way. It would be great to see her incorporate something like this in one of her tapestries. It was nice waking up in the morning hearing DY’s fork beating the wefts into place as she creates her latest tapestry using her own handspun and natural dyed wool. 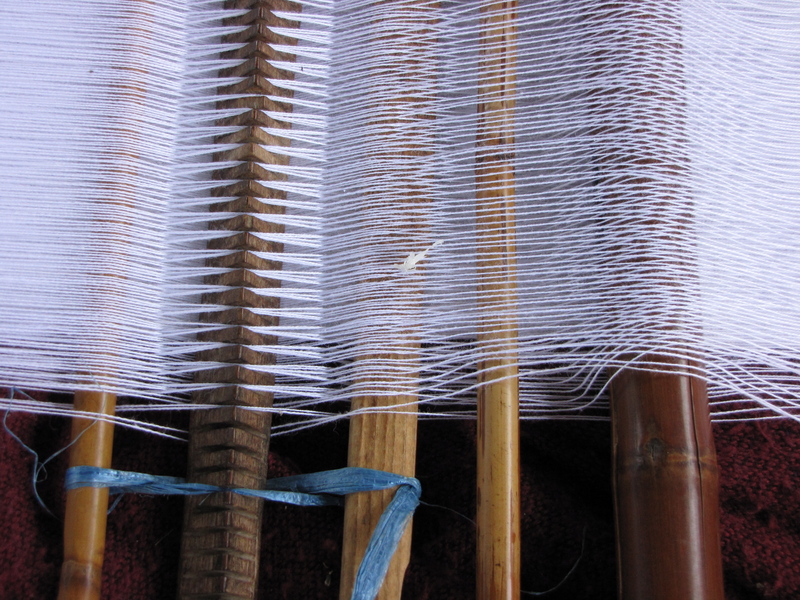 Her home has lovely solid wooden posts which are convenient for backstrap weaving. It was great to see the Ayoreo people of the lowland region in which I live in Bolivia represented. This the fifth time that they have been invited to attend the Market and sell their looped bags. 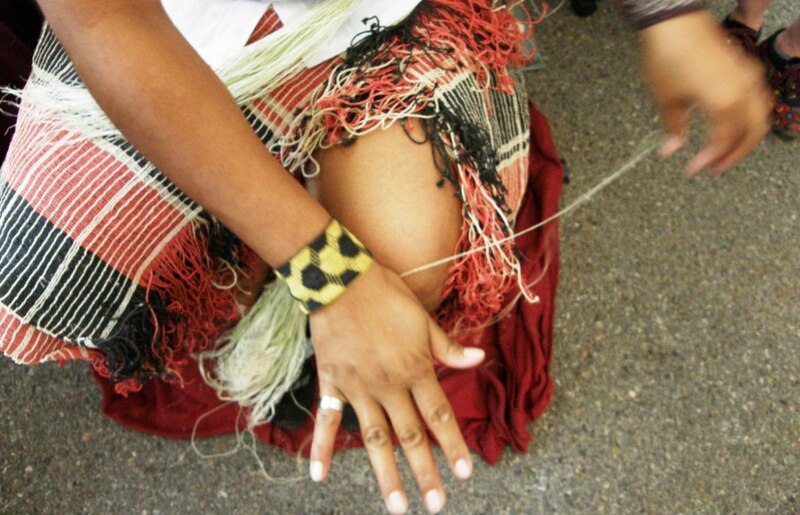 The fiber that is used for the bags is extracted from a wild bromeliad which in the Ayoreo language is called dajudie (elsewhere known as garabatá). The thread spun from this fiber is called dajua. One of the craftswomen was twisting three strands of thread into one on her thigh but, unfortunately, I was never present when they were making the actual bags. I have quite often seen the women making these in the streets of Santa Cruz but they are very reserved and not comfortable with people examining what they are doing or asking questions. I was, therefore, happy to be able to take the opportunity at the market to talk to the ladies (picture at left by Annie). 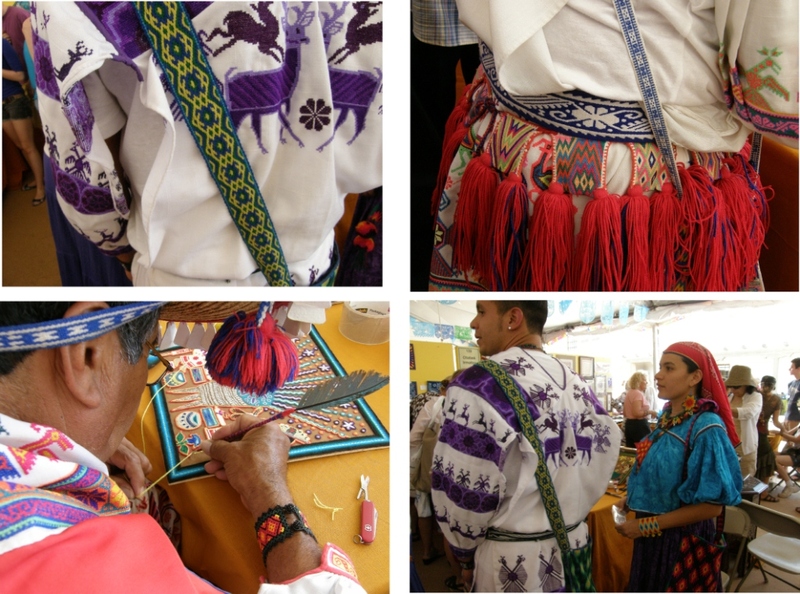 The traditional patterns belong to the seven clans of the Ayoreo society but some women have created their own new patterns inspired by their surroundings. 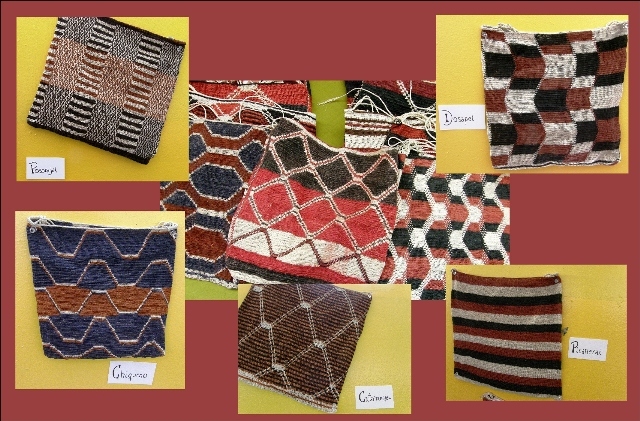 Mostly natural dye substances are used but some artificial colors are being used in response to the demand for brighter colors by customers. 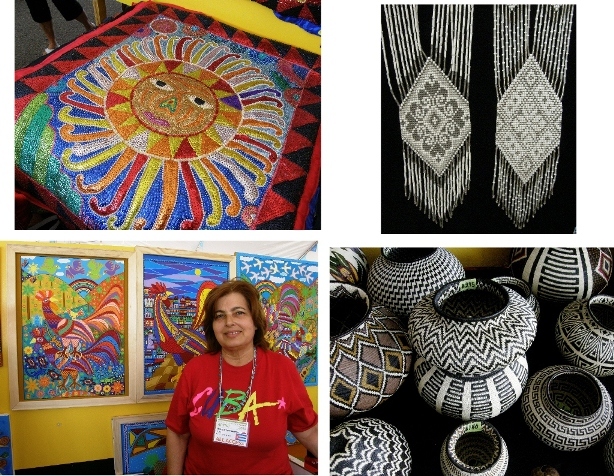 Bright colors and simple black and white: pictures made from colored sequins from Haiti, beadwork from the Ukraine, paintings from Cuba and baskets from Panama. 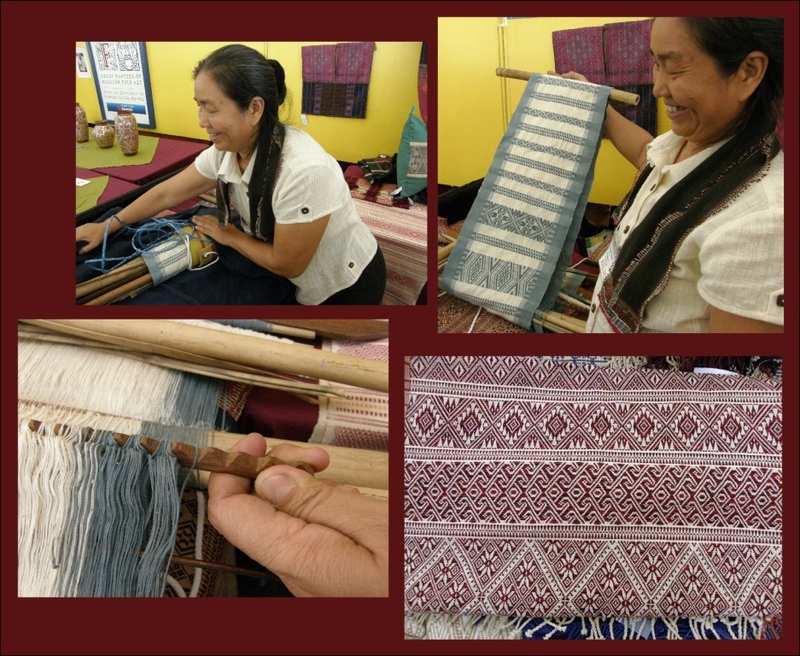 Khun Shwe, a backstrap weaver from Myanmar, was happy to open up her rolled up backstrap loom and show me her work in progress. Her circular warp held a piece of equipment that I had not seen before. She told me that the notched stick was used to help spread the warps. Her work with supplementary wefts was fine and beautiful. She was so friendly and happy to meet someone so interested in her loom. I would love to study with her! I think she was doing well at the market. Quite a few people were trying on garments at her booth including Annie. ...from Peru, Laos, India and Mongolia. It was only $25 and no, I didn’t buy it. A lady was walking around with one and I decided to ask her about her band weaving interests. It turns out that she doesn’t weave and had no idea what the piece was. She simply found it interesting and bought it. And the people came and came and looked and spent… When we were arriving at around 10am on Saturday, there were already early birds leaving with their purchases! I spent some time on Sunday afternoon with a very happy vendor from East Timor who had sold everything. Nilda was opening out this very large piece for an admiring couple when I was walking by and yes, they bought it! She couldn’t hide her pleasure at the sale. 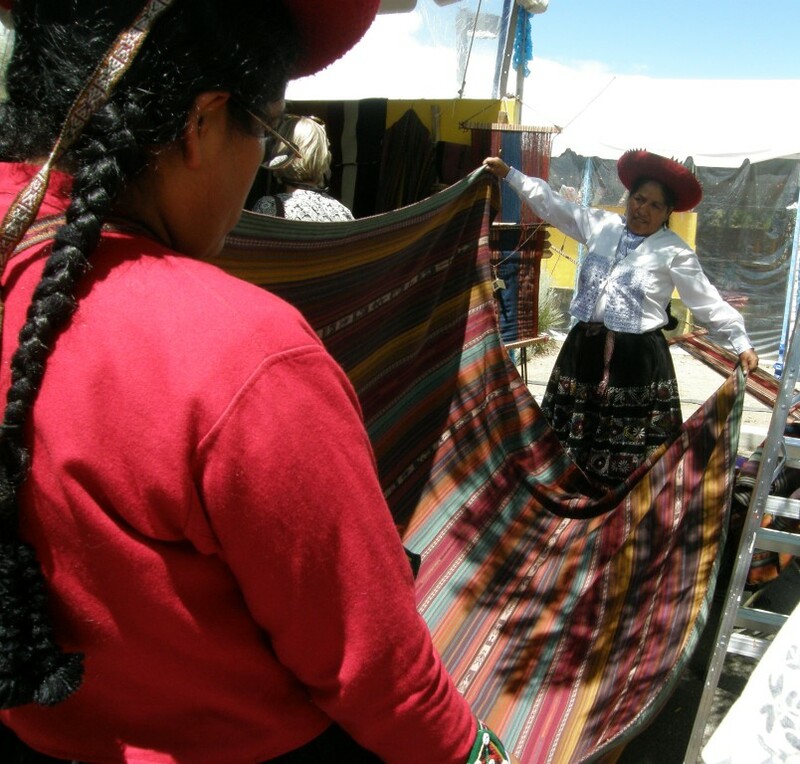 Of course, the ladies from Chinchero were seated at their looms and Nilda had a corner booth so they would have room to sit away from the crowded aisles in the shade and weave. That attracted a lot of people to the booth I am sure. 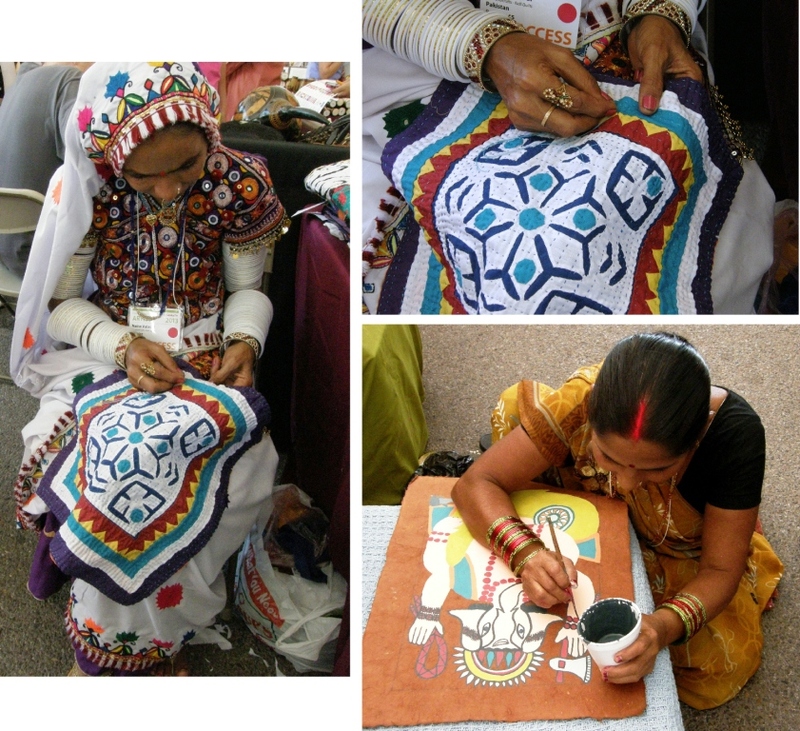 An artisan from Pakistan creates a piece using applique and reverse applique techniques while another from Nepal works on a painting. 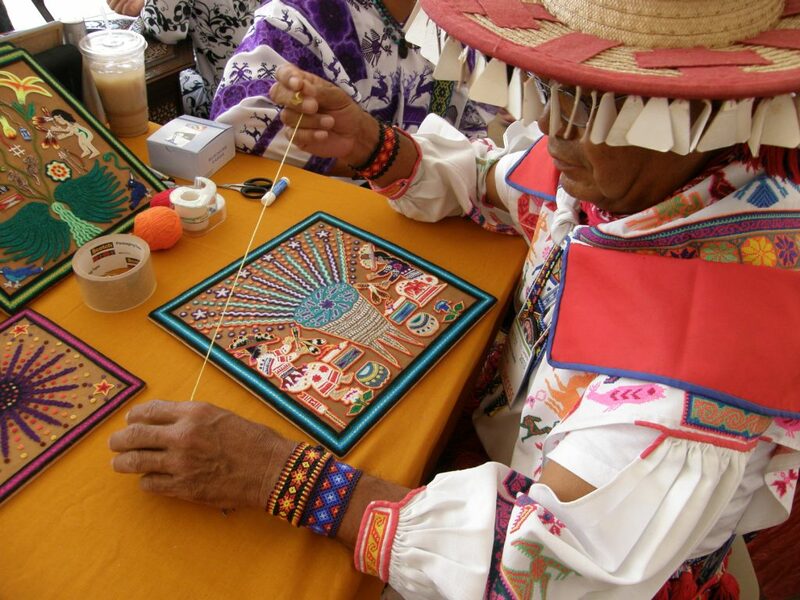 Everything about the Huichol artists from Mexico creating their yarn paintings was fascinatiing….all those woven bands and belts and straps to look at. There is more….much more. 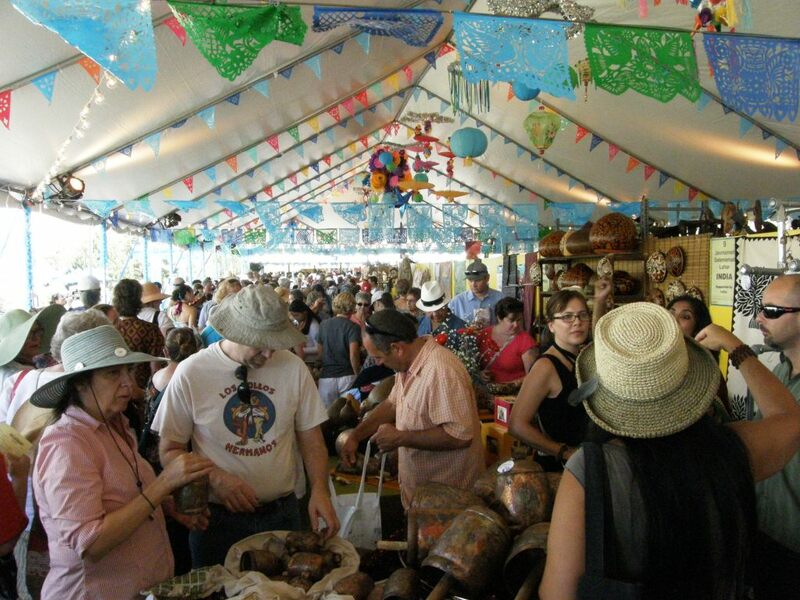 Remember that there were over 150 artisans there! This is just a taste of the color, and excitement. 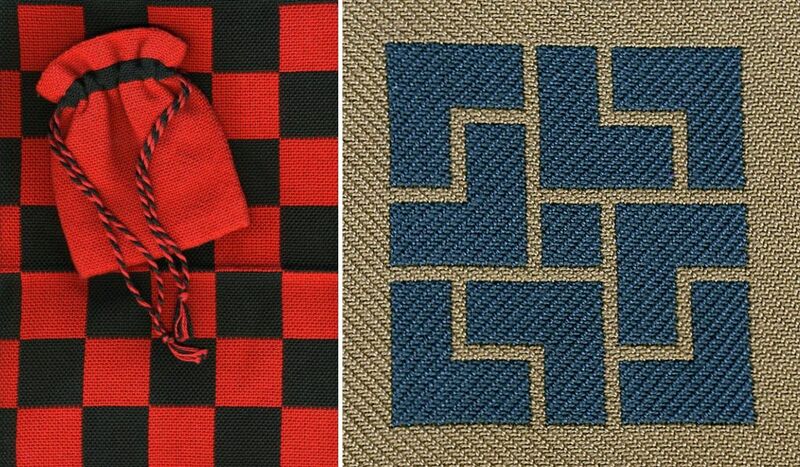 I am saving the vast majority of pictures of textiles decorated with supplementary wefts for another post. When I have finished my bag project, I will start the next in the red, black and white wall hanging series and this piece will be all about supplementary weft patterning. 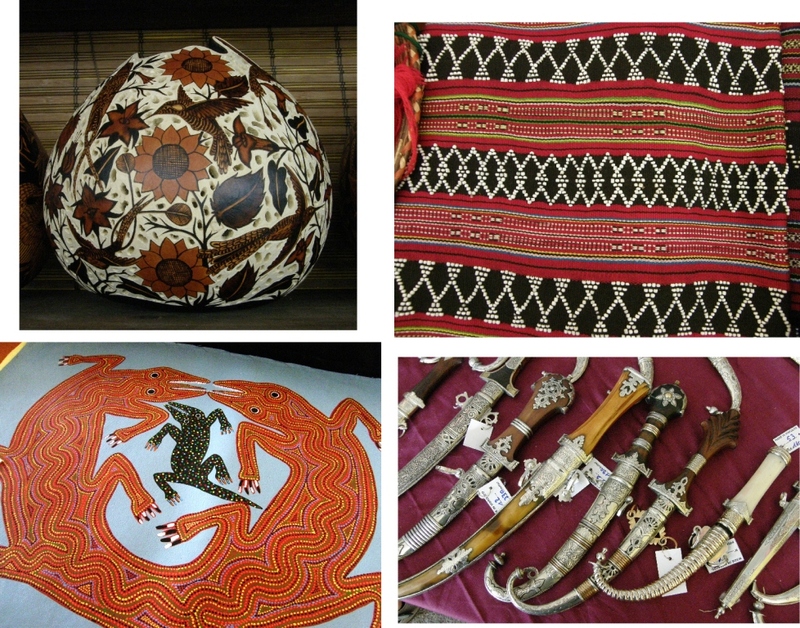 I will show more market pieces as I progress on that as well as pieces from Nagaland that were on display at the Travelers’ Market in Santa Fe. They have all kinds of interesting ways to decorate using supplementary wefts. Julia and I got to weave together and she has been captivated by supplementary- weft techniques. She sewed a band onto fabric and made a bag and then cleverly made a square braid for a strap, fanned out the ends and wove a balanced weave shoulder pad and then finished the braid for the other half of the strap (much the same as one would do when making an Andean sling). Cindy wove tubular band with me and is now making several slim bands to wear as a necklace, She is experimenting with making the bands in cotton. I find that it is harder to get an even finish with cotton than it is with wool. Her band looks great. Gmp set me a picture of her latest band.. She simply added rings to the end so that it can be used as a belt. The pattern is charted in my second book. I saw the handmade book made by Betty at ANWG. It was her contribution to the Portland Handweavers Guild study of Japanese textile techniques. The paper is handmade and from Nepal. Betty used a traditional binding for the book and wove the cover. 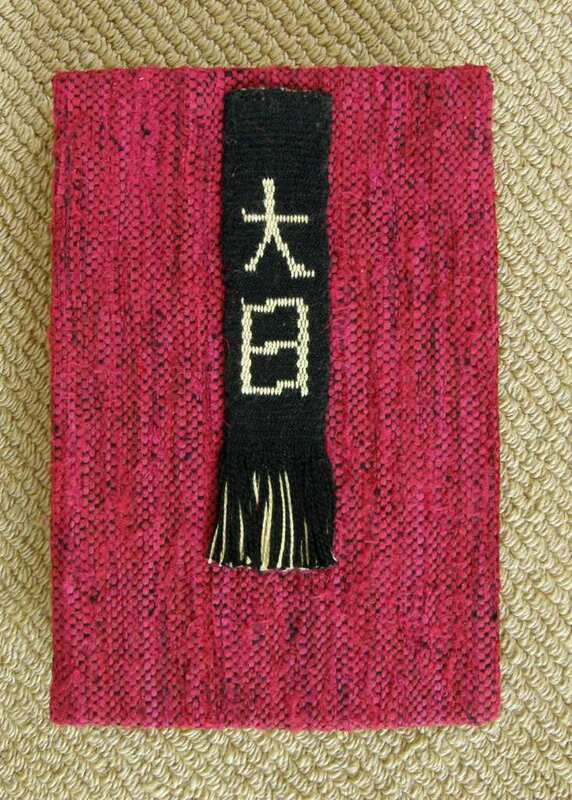 She wove a warp-faced double-weave band on a backstrap loom with Japanese characters to decorate the cover. From hooray Santa Fe to hooray Santa Cruz….the weather is supposed to warm up any day now to a pleasant coolness…perfect weaving weather. I have come home with lots of ideas from this trip and am happy to be back at the loom for a few months. My cat has gone to a new home. I spend too much time away and it is not good for her. It’s sad after ten years together but I know she is happy in her new place…she even caught her first mouse! 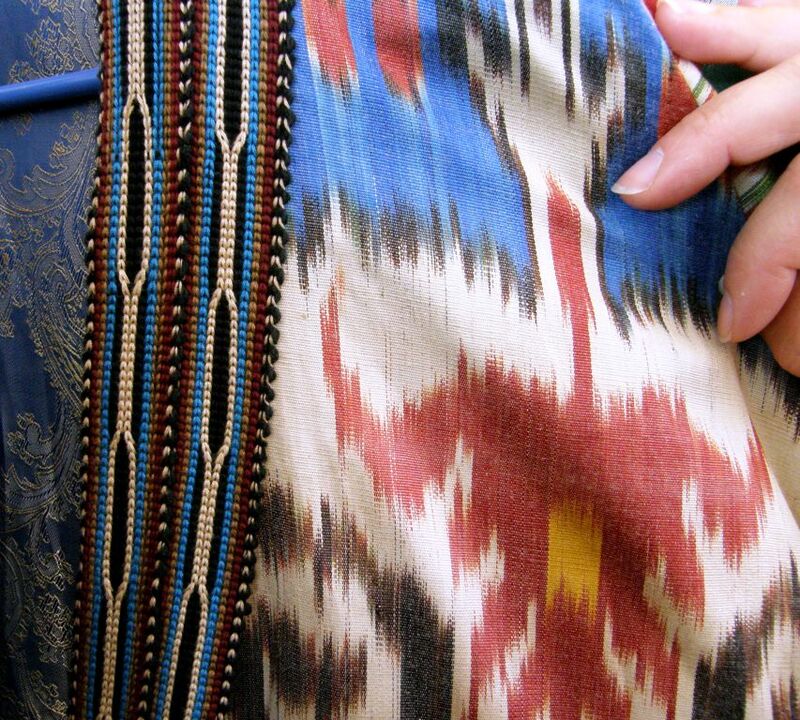 Those straps on the Uzbek caftans were done in 2-hole tablet weaving, so they aren’t that thick. There was an article in TWIST about this some time ago and it solved a riddle for me that I had stewed over for a long time. Many of the edgings there are also done in loop-manipulation, where more people are required, one to do the sewing and at least two to do the loop manipulation. OK, Yonat, and Laverne, I’m gonna try to go, too. Meet-up in Santa Fe! Wow! I’m going to have to study this post some more. Glad it was so lovely for you, Annie and the rest. Your black and white piece looks great. Oh my! I can see why you’ve dreamed of going there – what a dream come true! A delight for the senses and so much fun for you to meet up with gold and silver friends (old and new). Sooo much inspiration. 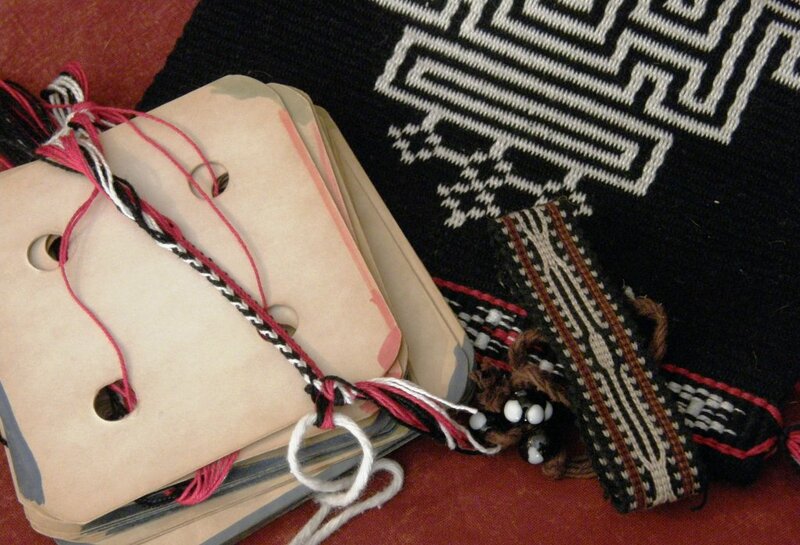 Your bag is already so beautiful – and will be even more so as you add more of your weaving skills to it. Just stunning. What a magical trip! I’ll have to start thinking about going too. The photo of the dark sky over the sun flooded plaza fills me with nostalgia. Thank you for the photo of the two hole card woven band. We were just talking about that technique at our last braiders meeting at Gudrun Polak’s. I have yet to try it. Thanks so much for sharing all the photos and info! 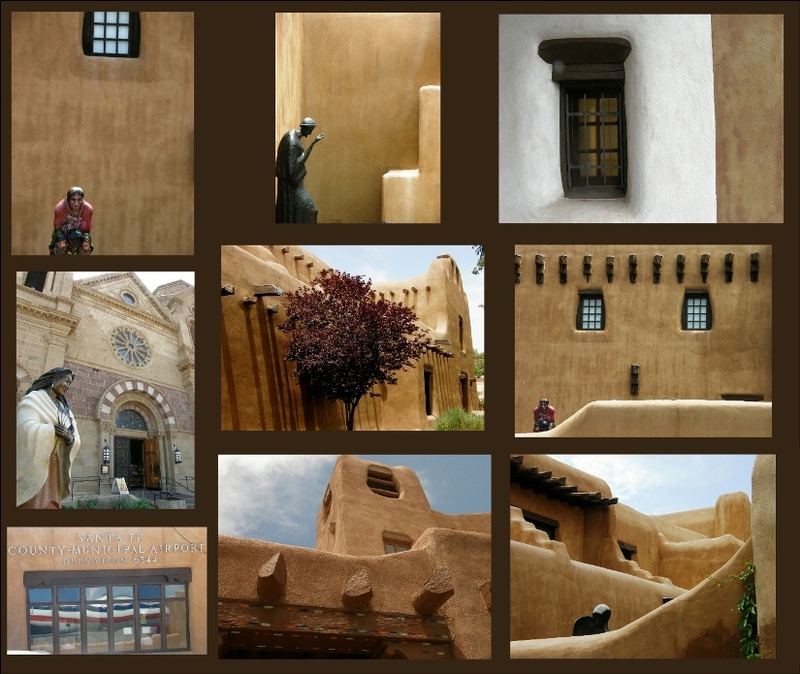 Laverne, I love all your photos of adobe buildings together – they look so wonderful with the brown background! 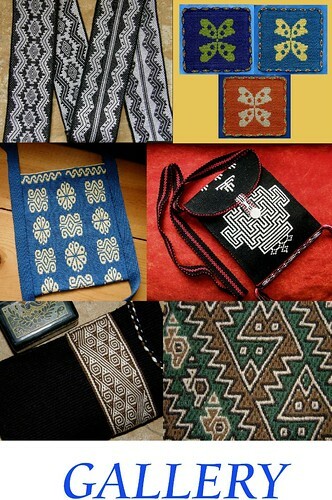 And your Bhutanese-inspired bag motifs look fabulous in white on black. Very dramatic. The man at the Uzbek stall was telling me what Ute has pointed out: that they weave those bands with 2-holed tablets. That is something that I also have not seen.